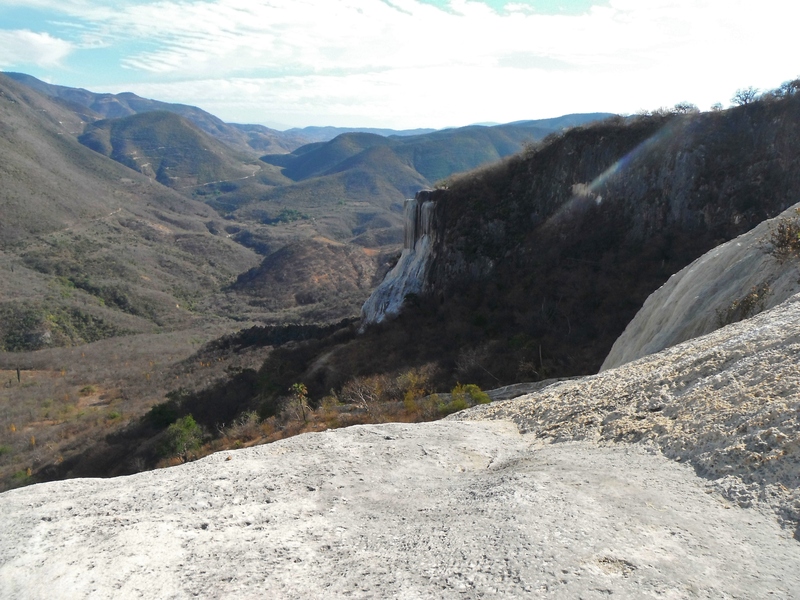 The city of Oaxaca sits at the meeting point of three valleys, los valles centrales. These valleys are full of fun sites and indigenous villages (as well as a good number of archaeological sites, but more on that later). The valleys are one of the major draws to visiting the city, and it was on a partly cloudy spring day that Austin and I set out to explore them. When looking over all of the things we wanted to do, we quickly started to become overwhelmed with the number of sites to see and the time it might take to get there. Up to this point, A and I had avoided organized tours and favored public transportation or our own two feet to get to sites outside of the cities we were staying in. But our days in Oaxaca were numbered and flying by fast, so we decided to cave and piled on an air-conditioned van with the other tourists. Overall, the ‘tour’ experience was much better than I expected. Our van was comfortable, and although it was full, our group was made up of only twelve or so people. The guide did talk a little too much, but he was generally friendly and informative. And despite my preconceived notion that tours were not for the budget traveler, ours cost us only M$200 (about US$16) per person and took us to five different places over the course of an entire day. Entrance fees and food were not included, but we would have incurred that cost anyway, and overall I found the time saved by not having to take public transportation was well worth the extra cash. 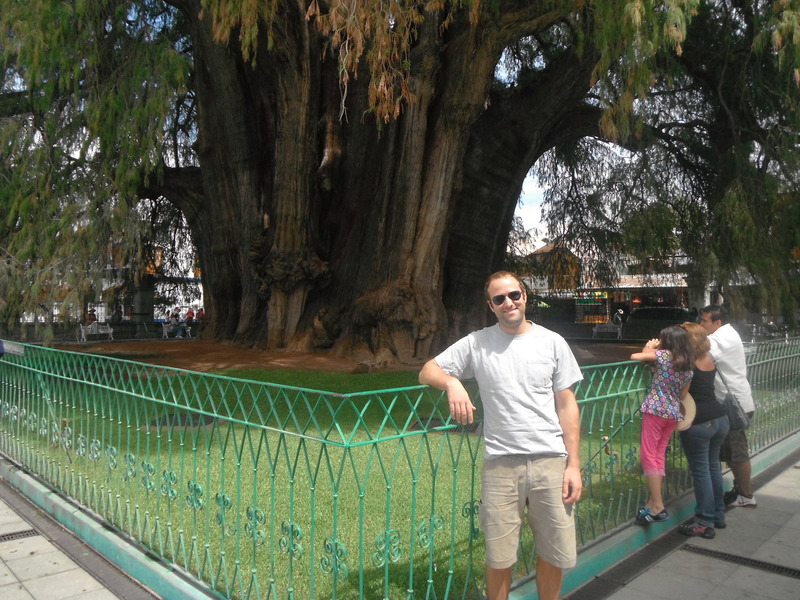 Our first stop was the village of El Tule, home of El Arbol del Tule – possibly the widest tree in the world – and with a diameter of 38.1 feet, I think it’s got a pretty decent chance of winning that distinction. Being the Disney fanatic that I am, I immediately compared it to the ‘Tree of Life’ at Animal Kingdom in Disney World. And if you squint your eyes and tilt your head at just the right angle, you can see the shapes of dozens of different animals – with a little imagination of course. Later I read in my guidebook that sometimes local children, as part of a school project, will give tours of the tree and point out all of the animals one might see in its mangled, magical trunk. 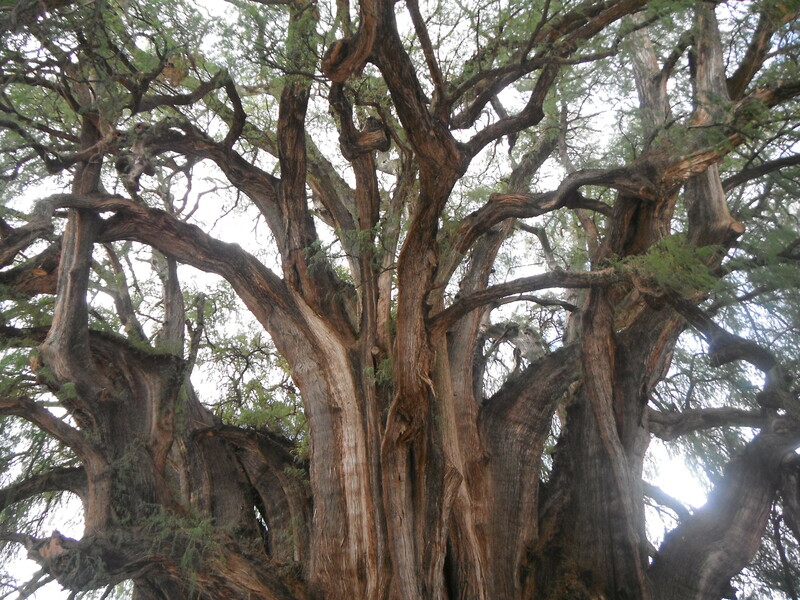 But they were not there that day, so I can claim my ‘tree of life’ analogy as original. 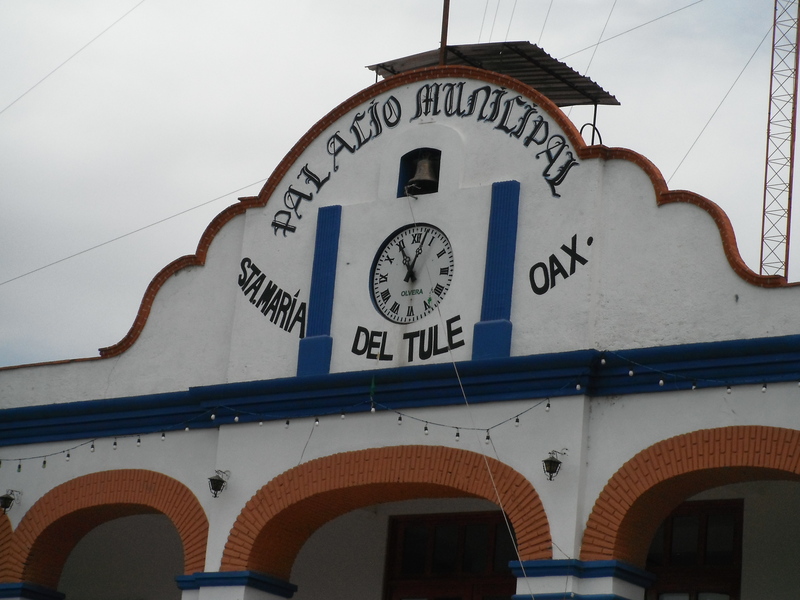 Next we visited a town called Teotitlan del Valle. This town is known for its weaving and for good reason. 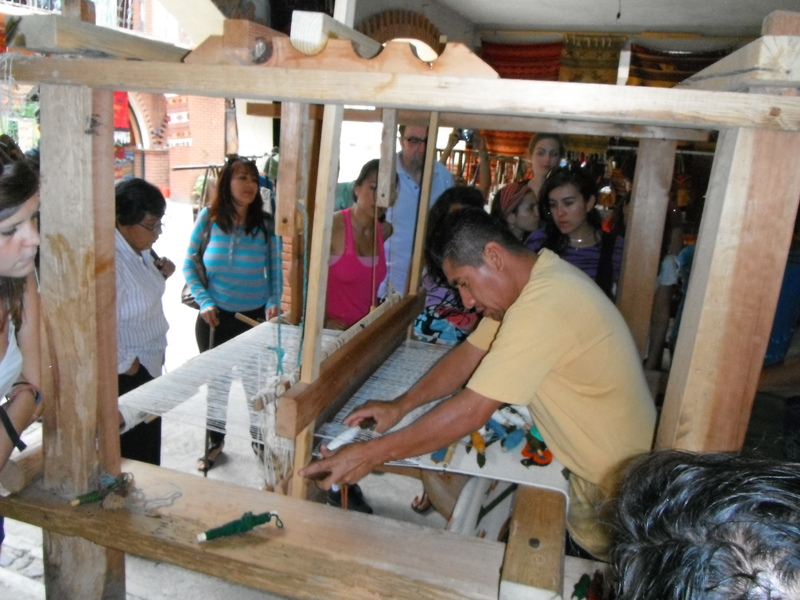 Its weaving tradition goes all the way back to pre-Hispanic times, when the town had to pay tributes of cloth to their conquerors, the Aztecs. Driving into the town it become immediately clear that weaving is the way of life here. 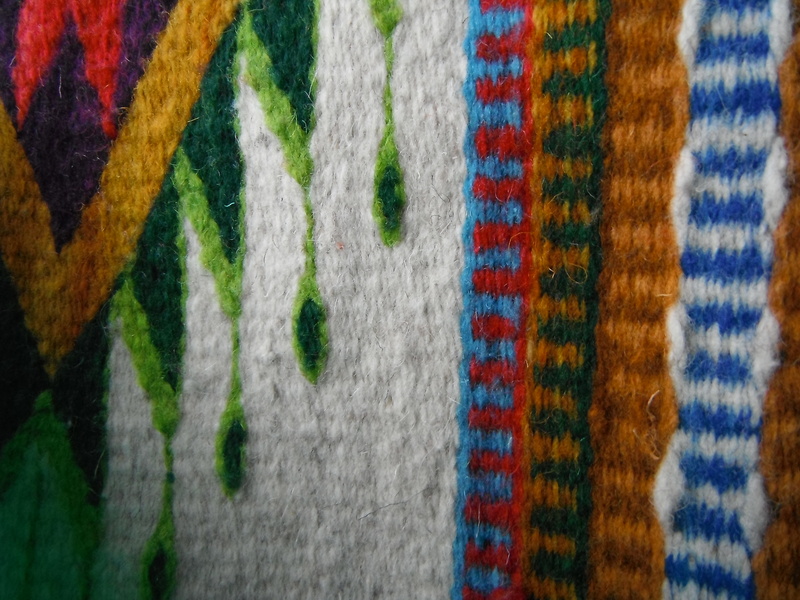 Every house and building we passed had beautiful rugs and blankets hanging from their windows. Many weavers sat at their machines on the front porch. 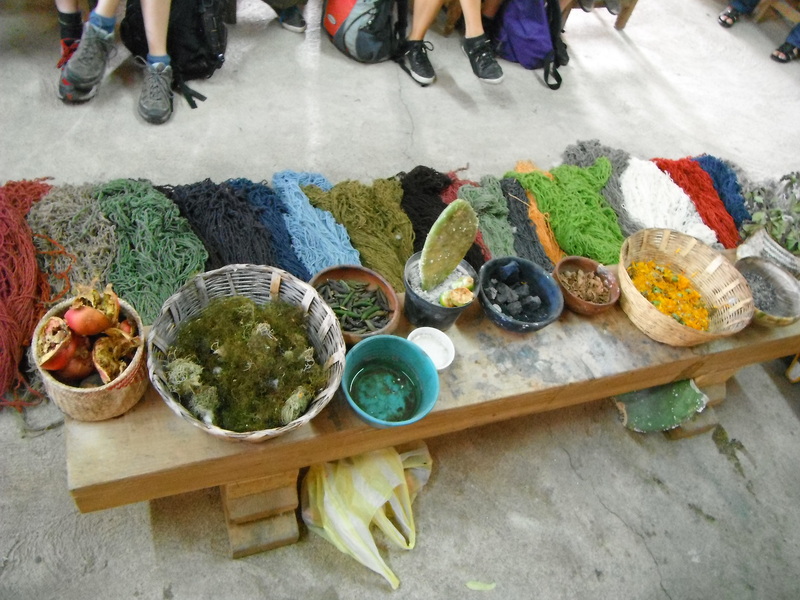 Our guide brought us to the home of a local family where we learned all about where they get the color for the dyes and how they weave the textiles. I was especially fascinated by the color presentation, as walking through the house I was immediately struck by how bright some of the colors were and automatically assumed they must be synthetic. But every color dye produced in that house came from organic materials. Not only did the weaver show us what plants produced the different colors, he demonstrated on the spot exactly how to get those colors! My favorite was the bright greens created from crushed pomegranate seeds and a limestone paste. Who knew? After the demonstration the weaver invited us to tour the showroom area where rugs, blankets, bags, and other woven art were on display for sale. This showroom was part of a co-operative of four local families, including the one whose house we were in, who made all of the pieces by hand. A white rug with bright green, purple, and blue decorations immediately caught my eye, but I hadn’t realized we’d have an opportunity to shop on the tour, so I hadn’t brought enough cash to make the purchase. Still, I eyed it longingly, inquired into the price, and sadly walked away. But the weavers were on to me! It wasn’t long before I was approached by a girl holding the very rug I had fallen in love with, asking how much I would pay for it. I told her I didn’t have enough money on me, and she told me that if we could agree on a price I could take the rug home now and she would stop by my hotel later so that I could pay. I had never seen a piece like this one, so I jumped on the chance, and after a little half-hearted haggling (I say half-hearted because although I wanted a good price, buying straight from this man’s house meant 100% of the proceeds go back to the artist, and trust me, he deserved every cent! ), I was headed happily back to the van with my new rug. 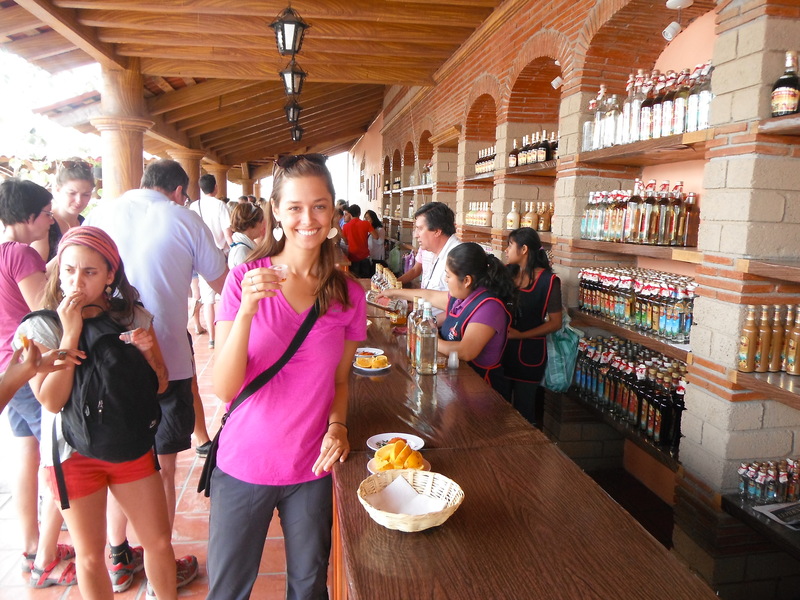 Next we were carted off to a Mezcal factory, where we learned how they make our new favorite drink and had the opportunity to taste dozens of different varieties. 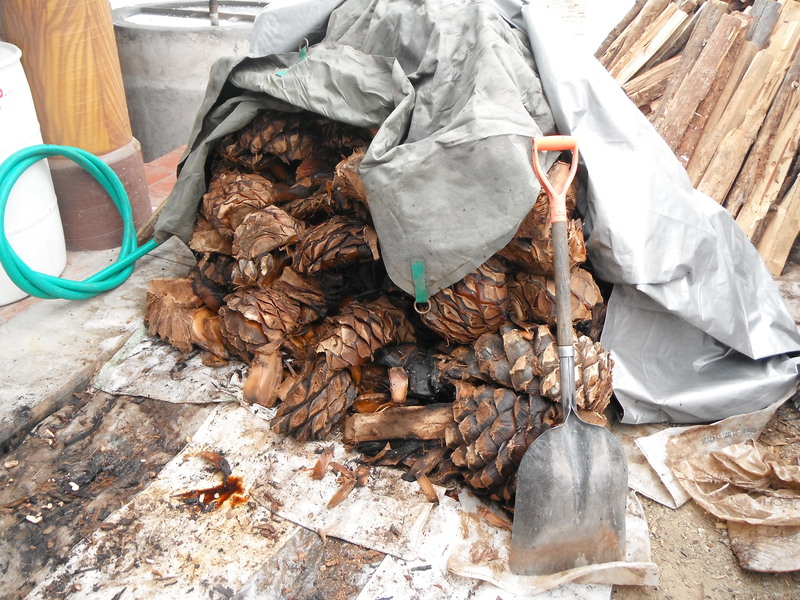 It was interesting to see the unprocessed agave hearts and learn about the distillation process. We found our wallets becoming looser and looser with each free shot, and A and I headed back to the van with a good armful of ‘souvenirs’ (to give as gifts of course!). Our last stop of the day was, literally, off the beaten path. 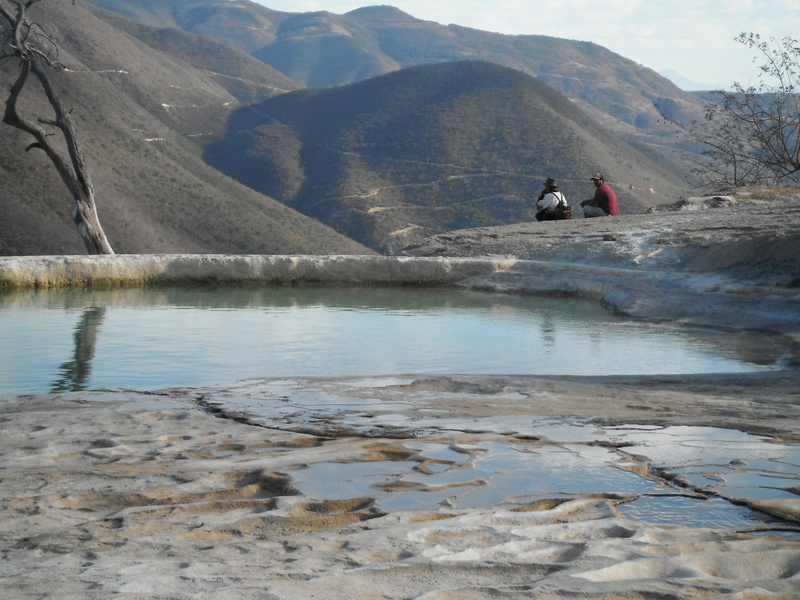 Our van headed through a small village and up a steep dirt road to arrive at Hierve El Agua or ‘The Water Boils.’ This is a mineral spring that bubbles out from the ground and into pools on a spectacular cliff side. Over millions of years the minerals in the water spilling over the cliffs have created what our guide referred to as ‘petrified waterfalls’ – white stalactite-like formations falling over the edge. It is quite the site to see. 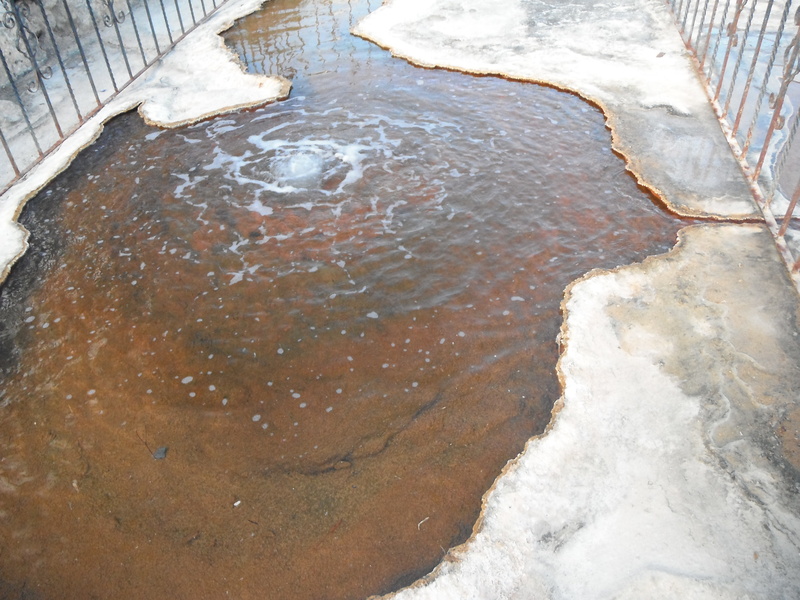 Although the name implies that the springs are hot, the use of the term ‘boils’ does not refer to the temperature of the water (it was actually quite cold). Instead, the name is in reference to the way the water comes out of small holes in the ground under such pressure that it appears to be boiling. Our tour also took us to a very cool archaeological site (more on that later) and an amazing buffet featuring Oaxacan specialties. 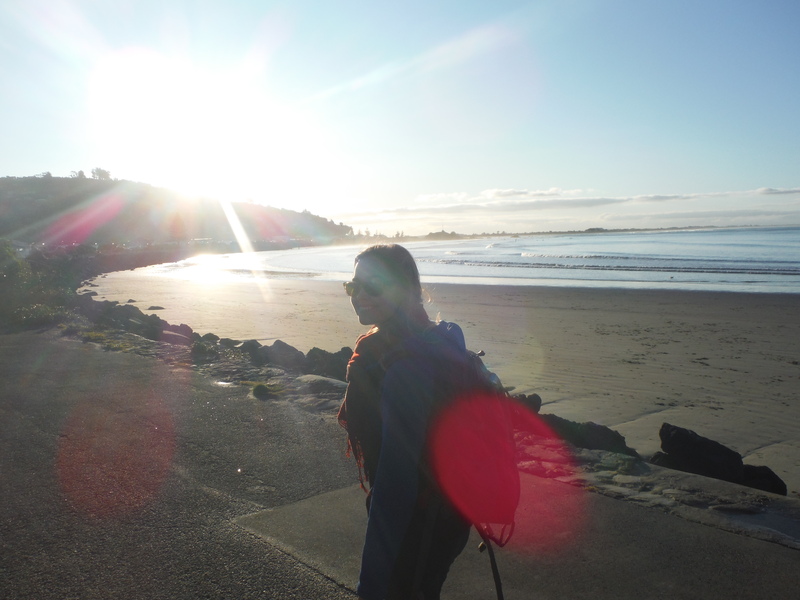 We arrived back in the city as the sun set, tired but absolutely enthralled by the adventures of the day. 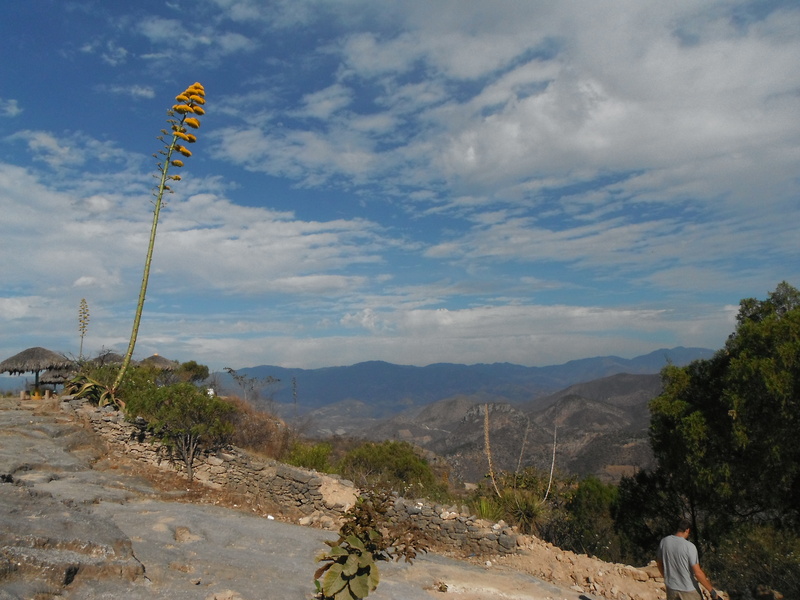 Oaxaca continued to spoil us with surprises, and after a little siesta, we would be ready for more.